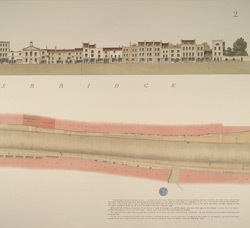 This sheet depicts a section of Knightsbridge showing the chapel in plan and elevation. The meticulous nature of Salway's drawings is revealed by the level of detail with which architectural features of houses, shops and taverns are represented in the elevation at the top of the sheet. Kennels, drains and grates are depicted in plan form in the lower part of the sheet. Lamp posts are numbered and drawn three dimensionally with a shadow.